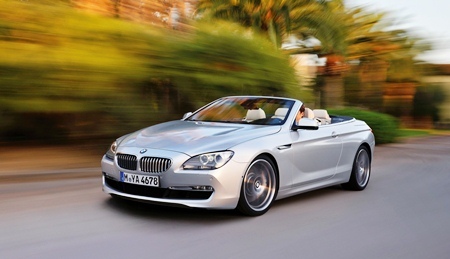 Home Auto Mania New BMW 6 Series convertible bigger, fatter and better? New BMW 6 Series convertible bigger, fatter and better? The new BMW 6 Series sports new engines that do deliver slight savings at the bowser with the 300 kW V8 using just 10.7 liters per 100 km (down from 10.9 L/100 km), and the 235 kW turbo six cylinder returning 7.9 liters per 100 km, as good as some small cars. The performance figures have not been compromised either, with the 3.0 liter turbo six cylinder just one-tenth slower than the old 4.8 liter V8 in the 0-100 km/h dash, and the new 4.4 liter turbo V8 six-tenths quicker, completing the dash in an impressive 5 seconds flat. And for the diesel enthusiasts, BMW are hinting at a diesel power plant as well. The new six-cylinder engine marks the return of an entry level six-cylinder model for the range, which since 2006 was only a V8. Both engines are matched to BMW’s new eight-speed automatic transmission. The new BMW 6 Series is wider, longer and lower to the ground than its predecessor and BMW claims the changes have produced more leg, head and shoulder room in the rear. The car is about 70 kg heavier than the previous 6 Series, mainly due to extra structural bracing for torsional rigidity that BMW says improves crash performance and cornering ability. Styling has moved away from the much un-loved Chris Bangle “flame surfacing styling” replacing it with more classic convertible lines more acceptable to buyers. By using a rag roof, rather than a folding metal one, BMW say this has resulted in more luggage volume. The boot on the new BMW 6 Series convertible has a 350 liter capacity with the roof up and 300 liter capacity with it down. No longer is it necessary to stop when it rains to raise the roof which can be lowered and raised at speeds of up to 40 km/h. BMW have gone for the full armamentarium of electronic driver aids – including adaptive suspension designed to retain the BMW’s sharp cornering, but also giving a better ride over rough surfaces. The standard suspension on the new BMW 6 Series convertible cannot be adjusted by the driver, but there are normal, sports and sports plus buttons, which adjust the car’s throttle sensitivity, steering feel, stability control settings and transmission shift points to suit different driving styles. Adaptive Drive adds a comfort button that allows the driver to alter the car’s suspension settings with different damper rates and stabilizer bar settings for more relaxed commuting and freeway cruising. If you want to go the whole hog, there is a new version of BMW’s jet-fighter heads-up display, night vision with pedestrian detection, automatic parallel parking, lane departure warning and a system that reads road signs and tells you the speed limit (but I doubt that you will find Thai in there). The car also offers internet access and a system that downloads and displays emails. The center display screen has been upgraded to give it a flatscreen look that reduces glare with the top down, while the instrument panel and heads-up display have been redesigned for better clarity. Safety includes front, head and thorax protecting airbags for front seat passengers and rollover protection bars that pop up if they sense a potential rollover to protect rear seat passengers. BMW has been coy about the pricing, but one thing is for sure – it won’t be cheap!